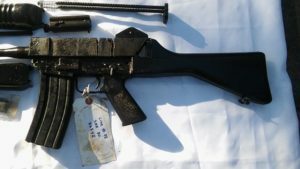 Bob Bowman has SAR-80 parts kits for sale and I have arraigned for a special group buy if I can get enough others to go in on the deal. This is time sensitive and I need to move fast before they are all gone. He is selling the kits for $650 each plus shipping and credit card fees. All that comes out to be just shy of $700 for one kit. If I can get a minimum order of 5 together the price drops and I can get them to you for about $625 each to your door. The only way I can make this work is to get money from you via PayPal then I can place the order and get them headed your way. Email me at rick@ar180s.com if you are ready to move. I need to make this happen in the next couple days. I have never seen kits come into the country before and I doubt we will again. 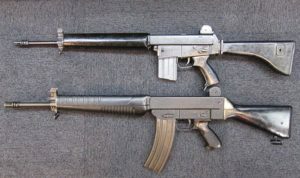 I also think these will be an easier build than an AR-180 due to the flat sides on the upper, the complete lower, and the fact that it uses STANAG mags that will count towards 922r. Semi conversion should be very strait forward as well. 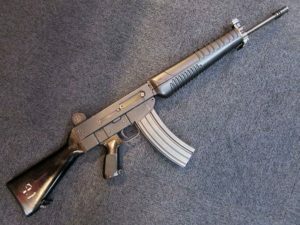 For those unfamiliar with the SAR-80 it is one of the first offshoots of the AR-18 and looks almost identical when you open the hood. As you know I am in for one. 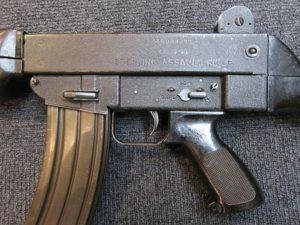 Photos appear to show an intact lower? but saw cut upper? Will email separately as well. Yes Rick the lower is intact. Upper is torch cut but both front and rear trunions are in perfect shape according to Bob Bowman. What is the plan for barrels on these? 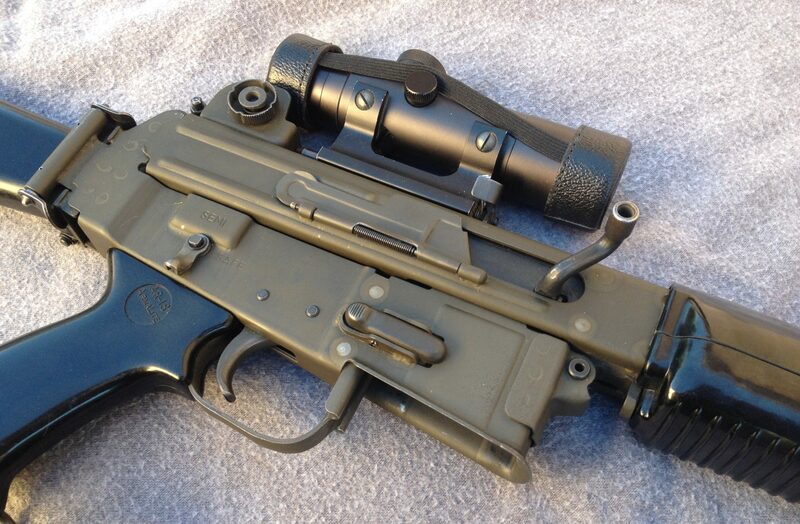 Does armilite still make barrels for AR180s? My plan is to reverse engineer the barrel dimensions and then turn a barrel blank or modify something existing. For most it will involve finding a local gunsmith to turn a barrel. 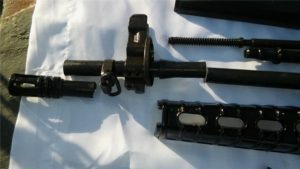 At this point I have no idea what the barrel threads look like compared to an AR-180. I have a new 180b barrel lying around and a SAR 80 kit on the way. I’ll let you know if it fits without mods. 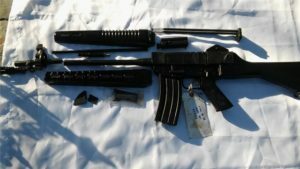 Green Mountain has these http://www.gmriflebarrel.com/gm-b2-21-5-56mm-gunsmith-edition-blank-with-a-phosphate-extension/ the real question is threads…They come in either 17 or 21 inches…I believe SAR80s barrels are 18 inches…So either go short or go long and lathe to spec. The big question I have is the threads on the barrel. 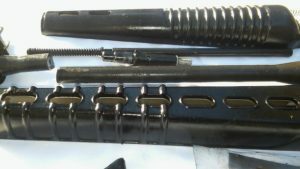 I have seen some more detailed pictures of the trunion area and it is much shorter than the 180 which tells me that it will need much fewer threads on the end of the barrel. 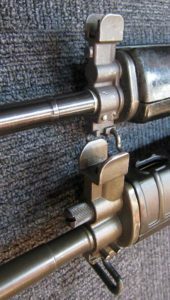 Threads on the AR-15 barrel, once the extension is removed, are shorter as well. Could be that an AR-15 barrel would be the best starting point. I have a 24′ HBAR barrel that might make a good candidate.